Well, you put the same question to a home buyer who gets betrayed by a grifter. In fact, it is happening in many cases these days. For many, buying a home is the largest financial transaction that they deal in their life. We know and respect the fact that your money is hard earned and thus educate you well before making the right choice without any conflict of interests. We have a solution for those who even come with special criteria. For buyers, we help you get maximum selling price and full asking price. From seller point of view, we help you negotiate the price. Many times, the cost of a property is a fait accompli where there is no chance to alter. However, as we are in the same field for over seven years and having a good rapport with all major builders, we know what works out and what not. Every Seller and Buyer has right to know what is happening the real estate market. 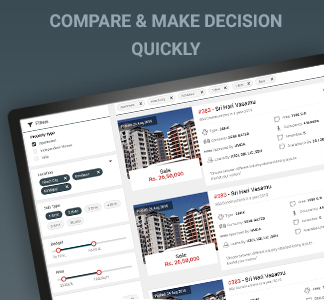 Our dedicated team of field executives, data analytics team, and IT staff at www.propertyadviser.in will provide you the much-needed reality information on a daily basis so that the customers will get everything they need at one place. Our aim is to keep each property on property advisor and make it a common platform to every seller, buyer, agent, and consultant. One can get 24x7x365 visibility of properties (24x7x365) in the search results. Our customized Dashboard helps you to view various Projects along with their performance and feedback.